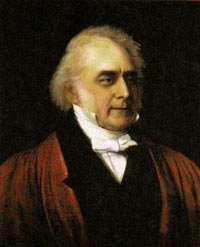 William King (17 April 1786 – 19 October 1865) was a British physician and philanthropist from Brighton. He is best known as an early supporter of the Cooperative Movement. By 1827, Robert Owen had taken his ideas of a co-operative movement to the United States. But they were picked up and amplified by Dr. King. King founded a cooperative store in Brighton. Then in 1828 he started a paper, The Co-operator  to promote these ideas. The Co-operator had a wide circulation and a great influence in the emerging movement. Though only published for slightly over two years, the paper served to educate and unify otherwise scattered groups. King's articles in the paper gave the movement some philosophical and practical basis that it had lacked before. "Knowledge and union are power. Power, directed by knowledge is happiness. Happiness is the end of creation." King lived at 23 Montpelier Road in the Montpelier area of Brighton. ↑ Collis, Rose (2010). The New Encyclopaedia of Brighton. (based on the original by Tim Carder) (1st ed.). Brighton: Brighton & Hove Libraries. p. 75. ISBN 978-0-9564664-0-2.